No plot, just having fun with costumes. That last panel makes me want to plan out the Dragon Doctors softball team. And the sixth one’s clothes could also double simply as “casual”, really. A girl has to dress right, even moreso than us guys. 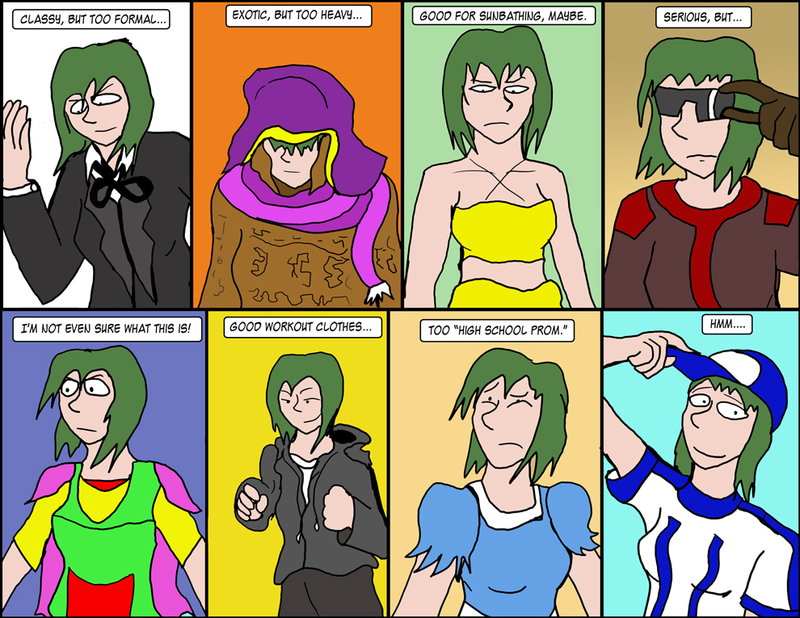 That last one looks like a good shift for Elka, makes her look more friendly and inviting while not without the ability to become inconspicuous. The first one! You can’t never have enough class! If not, the sixth, which is fine. Ooh, I’m with number one! The Doctor Who look. Formal becomes super cool during adventures! yeah but it makes her one hair color change away from looking like Cary. All the Doctor’s outfits have something unique about them, 4 was the scarf, a few had different hats, 13 (if you count the war doctor) has the red inside the jacket, Moffat had a celery lapel, the Doctor Who look is classy with something unusual mixed in, the first one is therefore not the Doctor Who look. Yes, yes I am, though Peter’s real name is Moffat, his daughter played Jenny, and now has the last name of Tennant…. I’d go with the first, but lose the tie. Still classy, slightly formal, but with a somewhat casual and rebelious touch to it. But, that’s -my- tastes, not hers. the last one though reflects current Elka, more friendly, welcoming, yet with a hat to allow her to stick to the shadows if she feels the need to. …this post will look impressive once the next page comes out, I swear. Can definitely see Elka experimenting with clothes in the wake of the past day or three as a way to re-center, re-affirm, and shore up her identity. I’m heavily biased towards the work-out clothes, given I used to wear that type of clothing on a daily basis. The “I’m not sure what this is” works for her. Really rocks the super-hero vibe.